Arcade was announced as the Premier Courseware of 2007 at the 2007 ASEE/IEEE Frontiers in Education Conference on Friday, October 12, 2007 in Milwuakee, WI. 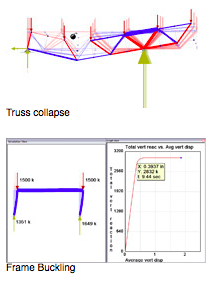 Arcade is a structural analysis program for nonlinear dynamic simulation. It is based on a computation method widely used in computer games. This method gives the program unique game-like interaction where structural models respond to input from the mouse and keyboard in real time. The program has been successfully applied in topics ranging from entry-level statics to graduate-level structural stability. Jeliot 3 is a program animation system intended for teaching and learning introductory programming. All steps in the execution of a program (expression evaluation, control flow, method calls, parameter passing, variables and object allocation) are animated on a “stage,” adjacent to the pane displaying the source code. The animation is fully automatic. Students and instructors need not make any modifications to the source code prior to animation. Animations can be executed continuously (variable rates are available) or step-by-step. Jeliot 3 has been employed in numerous programming courses worldwide and empirically evaluated in several classroom and laboratory studies. JFLAP is software for experimenting with formal languages and automata theory and can be used with a course in Formal Languages, Discrete Mathematics, or Compilers. With JFLAP one can create and test automata, pushdown automata, multi-tape Turing machines, regular grammars, context-free grammars, unrestricted grammars and L-systems. One can also experiment with LL and SLR parsing and proofs such as converting an NFA to a DFA, to a minimal state DFA and to a regular expression.